An adult eastern newt, Notophthalmus viridescens, from Clinton County, Iowa. THREATENED. It is illegal to kill or collect this species by law in Iowa. Newts are often found in quiet woodland pools near larger bodies of water in eastern Iowa. Terrestrial adults and the younger eft stages may look a little different than the aquatic adults. Any sightings should be reported to us or the DNR. Newts are 2 1/2 -4 inches long (Conant and Collins, 1991). Adults may be brown or green and have small black dots scattered about. Below they are yellow or yellow-orange with small black dots. The eft is rust brown, sometimes with red spots partly outlined in black. They have black dots and bellies similar to the adults. The terrestrial adult is dark brown above, often with no markings. The belly is like that of the other two stages, although it may be orange. The skin is rough in all forms, but more so in the land dwelling specimens. They have four toes on the front feet and five on the back. Of the many subspecies of the eastern newt, Notophthalmus viridescens, only one, the central newt, N. v. louisianensis, is found in Iowa. Records for this species are scattered about eastern Iowa. There are less than ten populations known. 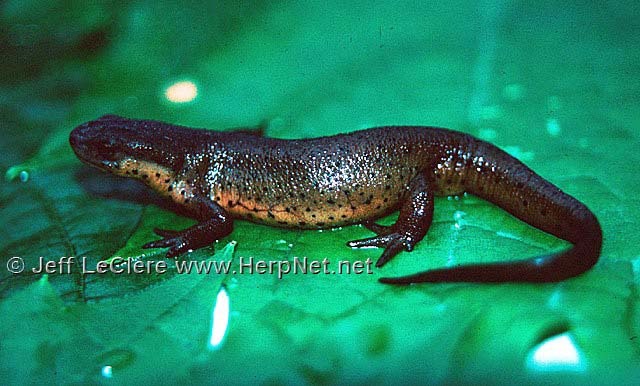 Although sampling has shown no new populations (Camper 1988) there many sites which may prove to contain newts in the future. Newts require small semipermanent woodland ponds for breeding. They live in forests during their terrestrial stages. They take shelter under logs, leaves, rocks and other objects, but it does not have to be moist under these shelters for newts to use them. Aquatic adults are found in pools, usually surrounded by woodland. A terrestrial adult eastern newt, Notophthalmus viridescens, from Linn County, Iowa. 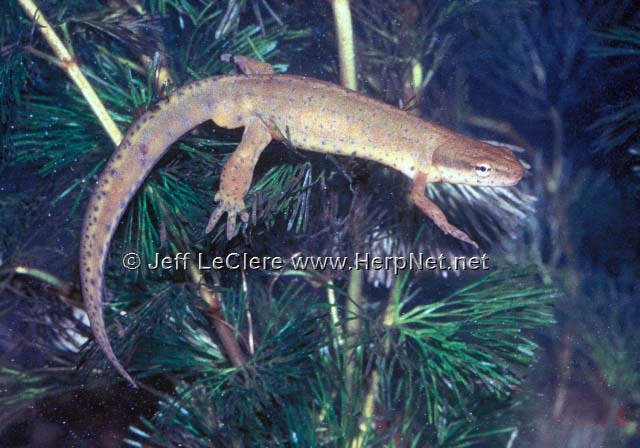 Aquatic adult newts are active in ponds all year. Efts and terrestrial adults overwinter under logs. Courtship and mating occur in the fall, winter, and spring. Females sometimes lay over 100 eggs singly or in clusters attached to vegetation in the water. The larvae hatch in late summer and either metamorphose into efts or become aquatic adults. The eft stage lasts from one to four years. After this time, they become aquatic adults that are sexually mature. Efts have rough, dry skin and may be found walking on the forest floor on a sunny day. They are the most agile of our salamanders on land. Efts are also toxic and foul-tasting to most predators. If the aquatic adults find their ponds drying up, they transform into a terrestrial adult until their pond refills with water. This stage is reported to be uncommon in Iowa (Camper 1984), but I have found that terrestrial adults are more common later in the summer in Iowa and Minnesota. They are difficult to trap, therefore, actively searching for specimens yeilds better results. Newts are not entirely restricted to small ponds, as they have been found at depths up to 40 feet in large lakes. Newts in all stages feed on small invertebrates. Small crustaceans, fairy shrimp, amphibian and fish eggs, and insect larvae are important adult foods.